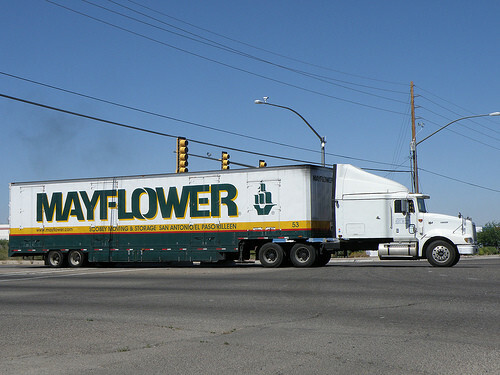 The Mayflower moving company offers a variety of moving services, ranging from local to a full-service long distance service, trying to make the moving quoting service as simple as possible, according to the website. With more than 90 years of service, the company notes they have “incredible insights” as to offer the best quotes for their customers, offering help each step of the way. How much does Mayflower moving cost? According to the official company’s website, the costs of Mayflower moving will be customized to your specific needs and will greatly vary depending on the pickup zip code, delivery zip code, the pickup date as well as the size of your home and number of bedrooms. Based on these factors and our research using the company’s estimator, the price per mile can greatly vary anywhere from $3 to as much as $16 per mile or about $0.65 to $0.85 per pound per 1,000 miles. How did we get these numbers? We used the company’s official estimator tool to gather these quotes, but remember, these are estimates only and can be more or even less, greatly depending on your circumstances as mentioned above. If you were to use the company’s estimator tool, they will want you to schedule an in-home estimate to receive a detailed quote. Based on estimates sourced online, we came up with the average in this table, but again, it can be hard to offer an exact estimate because, as you may know, there are so many factors to consider. NOTE: Remember, your quotes can change greatly based on the factors mentioned below. What determines the moving quote? The company will first ask that you complete the simple “request a quote online” form, where it will ask for your moving date, the origin zip code, destination zip code your contact information. If you do not want to fill the form out online, you can also call the company at 1.877.720.4066. If you do, be prepared to share information about your move, including the date of the move, where you’re moving to as well as information about your home and which add-on services you may want to add. Once you submit this information, the company will then call you to confirm an appointment, where an authorized representation will help discuss your needs and schedule a survey. On the day of your survey, the representative will be able to scan your home and belongings and determine the exact costs for your move based on your customizations. During this time, you do not have to commit to the move. This in-home estimate is required as per the Federal Motor Carrier Safety Administration. If you do decide to choose Mayflower as your moving company, then you will need to call the company, where a representative will help walk you through the process, offer tips, create a checklist for you and set the moving date. Some items are not allowed on a moving truck, such as chemicals, paints, batteries and anything else that’s considered to be hazardous. If you’re unsure, talk with a representative before your move to know what you can and cannot bring on the van. The company does state they can offer local moves; however, the company will refer you to local agents instead. Be sure to ask who you will be working with as the company works with more than 300 agents.